Rather than freely returning artworks stolen from victims of Nazi persecution, U.S. museums offer heirs less than fair market value, usually under secretive circumstances. This type of systematic extortion has been condemned in many other countries, such as Austria, which engaged in similar practices folllowing World War II. Below, Walter Westfeld's heir describes how the Museum of Fine Arts Boston insisted on a confidential settlement, rather than returning a stolen artwork in its possession. Check the MFA's website here, there is no information on this transaction. 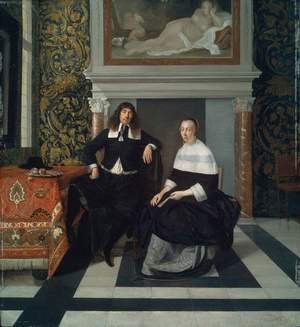 I tried to find some information on the provenance on Eglon van der Neer Portrait of a Man and a Woman In an Interior (1666). 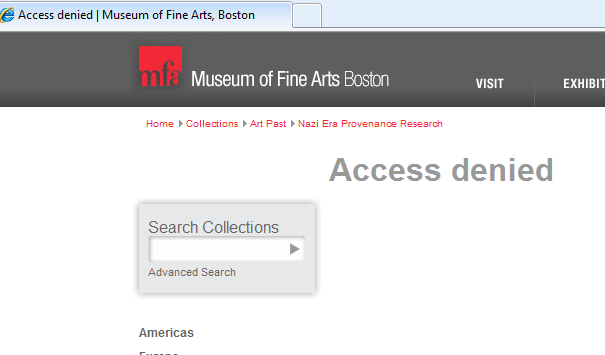 My access to that portion of the MFA's website was blocked. A puff piece on the MFA's purported provenance research here. The MFA claims that it prepares reports by a woman named Victoria Reed, but none of these reports appear to be made public. Ms. Reed is a "curator of provenance" - which appears to be a synonym for a launderer of stolen artworks. At issue is the role of U.S. museums in buying stolen art on an industrial level before, during and after World War II, profiting from the misery of murdered European Jews. The role of U.S. museums in acquiring stolen art has largely been ignored by academics, with U.S. museums cloaking their actions in secrecy. Although U.S. museums claim to engage in provenance research, little or none of this research is published, few original documents are made available, and no research is available on how much of a burden this traffic in stolen art has placed on U.S. taxpayers. In Cabell v. Sony Pictures Ent. Inc., 10-2690-cv (June 24, 2011), the Second Circuit in a summary order affirmed the trial court's grant of summary judgment in a suit for copyright infringment. Art Litigation: June 30 CLE Presentation at Modern Restaurant at MoMA: How Long Do Victims of Nazi Spoliation Have To Get Their Art Back? I hope that you can join me in a CLE presentation of Grosz v MoMA at the Modern Restaurant on June 30 (next Thursday) - the flyer is embedded below. In Barclay's Capital Inc. v. TheFlyontheWall.com, (10-1372-CV June 20, 2011), the Second Circuit found that publishing brief factual summaries of investment recommendations was not the basis for a misappropriation claim under New York law. The defendant had already been enjoined from republishing investment reports in their entirety, this issue was not part of the appeal. The defendant continued, however, to publish very brief factual summaries of the recommendations in the investment reports. The district court's injunction blocked republication of this information for a period ranging from 30 minutes to several hours. The investment banks claimed that the information was valuable only for the morning trading and that its proprietary nature incentivated their respective clients to trade through the firm issuing the report. Google and Twitter appeared as amici and asked the Second Circuit to repudiate the "hot news" misappropriation tort in its entirety. The Second Circuit declined to do so expressly, but reached a similar result by applying the preemption doctrine. We conclude that in this case, a Firm's ability to make news -- by issuing a Recommendation that is likely to affect the market price of a security -- does not give rise to a right for it to control who breaks that news and how. We therefore reverse the judgment of the district court to that extent and remand with instructions to dismiss the Firms' misappropriation claim. The case is a very important one for the future of the internet and such services as Google and Twitter. It also has strong philosophical implications with a section on the "moral dimensions" of the question replete with footnotes about the bible's competing views on reaping where one has not sown, and on the other hand, being forbidden to reap even where one has sown (see P 43 and FN 27 in the embedded opinion below). This webinar will go over how to efficiently address counterfeit products and grey market goods. This webinar will cover topics such as: trademark filings, the difference between trademark infringement, counterfeit products, and counterfeit goods, special issues relating to counterfeit products online, strategies to stop counterfeiting, stopping goods at the border, using Customs to protect your trademark, strategies to prevent your goods from being detained by Customs, and classification issues. 3163 John F. Kennedy Blvd. In Murphy v. Millenium Radio, 2011 WL 2315128 (3d Cir. June 14, 2011), the Third Circuit is the first court of appeals to reach the question of whether removing an author's name from a photograph constitutes a violation of section 1202 of the Digital Millenium Copyright Act 17 U.S.C. 1202. The Third Circuit noted a disagreement among district courts on the question. The case involves a photographer who took photographs of WKXW radio personalities Craig Carton and Ray Rossi for a magazine (picture above). The shock jocks posed naked behind signs covering their privates. A WKXW employee scanned the photographic image, uploaded it, and the radio station invited listeners to digitally modify the image for a competition. When the image was uploaded, a "gutter credit" (inner margin) from the magazine containing the photographer's name was removed. The Third Circuit reversed the trial court's grant of summary judgment, permitting the DMCA 1202 claim to proceed. The Third Circuit also permitted a defamation claim to proceed, Rossi and Carton allegedly called the photographer a homosexual and destroyed transcripts of the show. (d) Law Enforcement, Intelligence, and Other Government Activities. — This section does not prohibit any lawfully authorized investigative, protective, information security, or intelligence activity of an officer, agent, or employee of the United States, a State, or a political subdivision of a State, or a person acting pursuant to a contract with the United States, a State, or a political subdivision of a State. For purposes of this subsection, the term “information security” means activities carried out in order to identify and address the vulnerabilities of a government computer, computer system, or computer network. (B) such person did not intend, by engaging in such activity, to induce, enable, facilitate, or conceal infringement of a right under this title. (ii) the activity that constitutes such violation is not intended to induce, enable, facilitate, or conceal infringement of a right under this title. (III) an applicable industry-wide standard relating to the transmission of information in a digital signal that was adopted in a voluntary, consensus standards-setting process open to participation by a representative cross-section of broadcast stations or cable systems and copyright owners of a category of works that are intended for public performance by such stations or systems. (B) the term “cable system” has the meaning given that term in section 602 of the Communications Act of 1934 (47 U.S.C. 522). (a) Civil Actions. — Any person injured by a violation of section 1201 or 1202 may bring a civil action in an appropriate United States district court for such violation. (6) may, as part of a final judgment or decree finding a violation, order the remedial modification or the destruction of any device or product involved in the violation that is in the custody or control of the violator or has been impounded under paragraph (2). (2) Actual damages. — The court shall award to the complaining party the actual damages suffered by the party as a result of the violation, and any profits of the violator that are attributable to the violation and are not taken into account in computing the actual damages, if the complaining party elects such damages at any time before final judgment is entered. (3) Statutory damages. — (A) At any time before final judgment is entered, a complaining party may elect to recover an award of statutory damages for each violation of section 1201 in the sum of not less than $200 or more than $2,500 per act of circumvention, device, product, component, offer, or performance of service, as the court considers just. (4) Repeated violations. — In any case in which the injured party sustains the burden of proving, and the court finds, that a person has violated section 1201 or 1202 within three years after a final judgment was entered against the person for another such violation, the court may increase the award of damages up to triple the amount that would otherwise be awarded, as the court considers just. (A) In general. — The court in its discretion may reduce or remit the total award of damages in any case in which the violator sustains the burden of proving, and the court finds, that the violator was not aware and had no reason to believe that its acts constituted a violation. (i) Definition. — In this subparagraph, the term “public broadcasting entity” has the meaning given such term under section 118(g). (ii) In general. — In the case of a nonprofit library, archives, educational institution, or public broadcasting entity, the court shall remit damages in any case in which the library, archives, educational institution, or public broadcasting entity sustains the burden of proving, and the court finds, that the library, archives, educational institution, or public broadcasting entity was not aware and had no reason to believe that its acts constituted a violation. (b) Limitation for Nonprofit Library, Archives, Educational Institution, or Public Broadcasting Entity. — Subsection (a) shall not apply to a nonprofit library, archives, educational institution, or public broadcasting entity (as defined under section 118(g)). (c) Statute of Limitations. — No criminal proceeding shall be brought under this section unless such proceeding is commenced within five years after the cause of action arose. I hope that you will join me tomorrow night at this event, there is no charge for attendance. Fine art and the copyright laws have always had an uneasy relationship. Artists should be free to use their surroundings as raw material for free expression. But shouldn’t artists get paid for their creativity? And what happens when we live in a media world and our surroundings are locked down by copyright? Should an artist have the power to use the courts to seize and destroy another artist’s work? Join us as attorney Ray Dowd takes us on a visually-driven exploration of creativity at the cutting edge and the fate of “appropriation artist” Richard Prince in the ongoing lawsuit with French photographer Patrick Cariou. Raymond J. Dowd is the author of Copyright Litigation Handbook (West 5th Ed. 2010). He is Co-Chair of the Art Litigation and Dispute Resolution Institute at the New York County Lawyers’ Association. He is an attorney in private practice with Dunnington, Bartholow & Miller LLP a firm with practices in trusts & estates, litigation, copyright, trademark and art law. In TMTV Corp. v. Mass Productions Inc., ---F.3d---, 2011 WL 2306514 (1st Cir. 2011), the First Circuit considered two competing Puerto Rican television shows 20 Pisos and El Condominio (more on Wikipedia here). As in so many of these stories, the initial brainstorming sessions were not set down in writing, later-produced scripts were the result of the amorphous brainstorming session, and in the end, all claimed copyright. Here, one purported author supplied ideas at the brainstorming session. He lost because of copyright law's requirement of "fixation" - that is, that in order to have a copyright, the ideas must be written down. Other authors wrote scripts based on the brainstorming session. 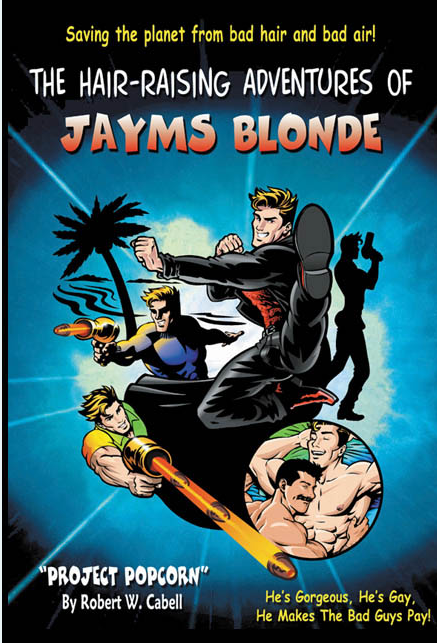 Those authors, however, did not dispute that they'd agreed to write the scripts as works-for-hire. Later, the authors were paid and executed agreements stating that the scripts were works for hire. For students of civil procedure and how it relates to the Copyright Act, the decision is instructive on the issues of settlements, damages, and pre- and post- judgment interest. The Hon. David H. Souter (Ret.) of the Supreme Court of the United States sat by designation. Below is a brief we filed last week on behalf of Stan Lee Media Inc. before the Second Circuit Court of Appeals, seeking to overturn the district judge's denial of intervention in Lee v. Marvel. Enjoy the YouTube video of "Tighten Up" from the album Brothers by the Black Keys, above. The Black Keys are not happy with the Della Femina advertising agency and Valley National Bank and claim that the agency has used Tighten Up without permission in an advertisement. 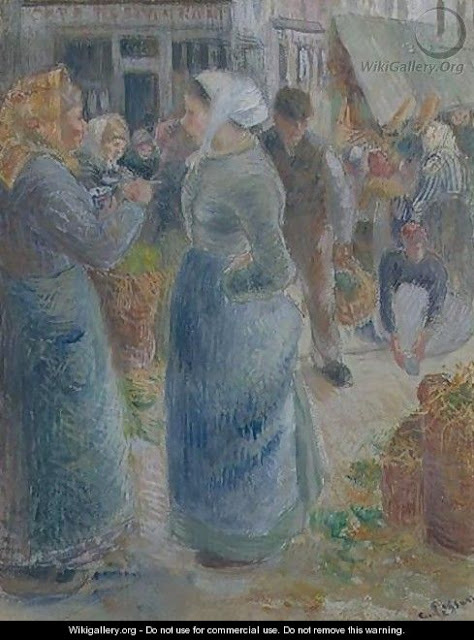 In U.S. v. Davis and The Painting Known as "Le Marche" by Camille Pissarro, 2011 WL 2162897 (June 3, 2011), the Second Circuit rejected the "innocent owner" defense to a civil forfeiture action brought by Customs to enforce the National Stolen Property Act. The monotype was stolen from the Musee Faure in Aix-Les-Bains in France on November 1981. Once the government established probable cause that the painting was stolen, the burden of proof shifted to the possessor of the artwork to show that it was not stolen. The work was consigned for sale to Sotheby's, where it was seen by the French police, who notified customs. Ouch! Are they really dancing with CD's? Fair Use Fridays: Columbia Pictures Faking Copyright Infringements To Promote Girl With a Dragon Tattoo? This YouTube video is made to appear as if it were created by a pirate cameraman inside a movie theater. 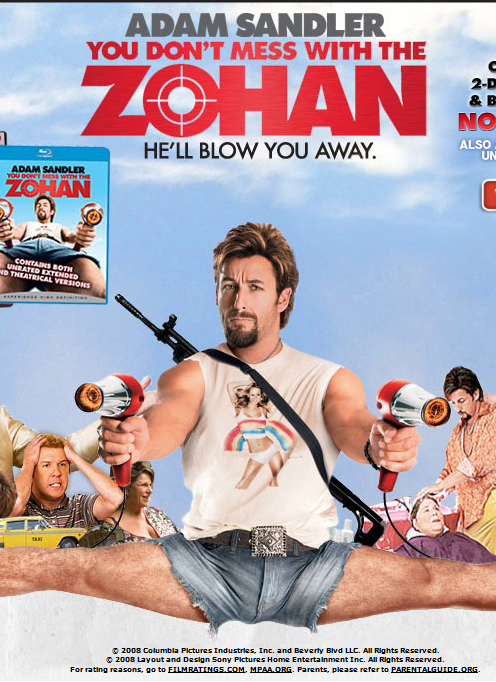 Mashable believes that SONY/ Columbia Pictures has faked the copyright infringement as part of a viral marketing campaign. Mashable's take here. So a copyright owner fakes an infringement of its own work to make the movie cool to kids who prefer to watch pirated content? Does it help the analysis if the movie is a about a young female hacker? 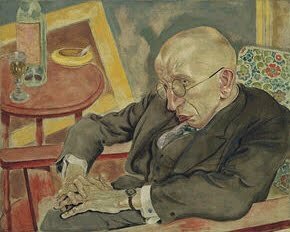 We recently filed a petition to the U.S. Supreme Court on behalf of the heirs of George Grosz in Grosz v. Museum of Modern Art, accessible by the link below. The certiorari petition describes how in federal courts around the country, museums and holders of artworks taken from Nazi persecutees have successfully advanced doctrines of constructive notice that have eviscerated the right under state law to recover stolen property that Congress thought existed when it enacted the Holocaust Victims Redress Act of 1998. As the cert petition shows, museums told Congress that state law remedies were sufficient for victims and their heirs to recover stolen artworks. After 1998, with Congress off their backs, museums then argued to the courts that no remedies were available under state law to those who actually tried to reclaim artworks. Several museums even retaliated against Jewish heirs by suing them. By filing these pre-emptive strikes, museums successfully avoided scrutiny into the question of whether or not the art was stolen. By leaving potentially looted artworks in our museums, such "quiet title" actions have stained our national conscience. Unfortunately, very few voices have been heard to draw attention to this tremendous crime. Media coverage is anecdotal. Each time stolen artworks are uncovered in museum collections, the museums feign horror and surprise, but the reality is that in the high-tax Cold War years, laundering stolen art was a major function of the U.S. museum community. We are all now paying for those Cold-war "don't look a gift horse in the mouth" policies. A generation of wealthy Americans dodged taxes by flipping stolen property to museums, thus passing the societal cost of their misdeeds onto the backs of U.S. taxpayers. In turning their backs on restitution of Nazi-looted artworks after 1998, American museums have betrayed our trust and have become international scofflaws. This is a major problem and inconsistent with the traditions of common law under which no one can take good title from a thief. It is also inconsistent with the traditions of equity, which do not unjustly enrich those with superior knowledge, such as the museums, that should have known better than to profit from the world's worst crime. Everyone in the art community, thanks to U.S. government warnings starting in the 1940's, knew that acquiring an artwork of European provenance that entered the country after 1932 but was created before 1946 was a "red flag". Art historians now pretend to have no knowledge of this and instead play a game of blaming the victims and waiting until enough people die or are discouraged so that they can assert the defense of laches. While museums throw up endless new buildings, they claim they can't even afford to figure out what stolen art is in their collections. And by refusing to share documents and publish provenances, they ensure that no one else can figure out the stolen property trail either. American museums, having unclean hands, should not be heard to invoke equity. American museums, which should be taking the lead in opposing Holocaust profiteering, have instead set up impenetrable legal defenses and hide the truth behind spurious claims of privilege. This is both morally and legally untenable. If U.S. museums don't do the right thing and show world leadership in returning the property of Holocaust victims, no one will.